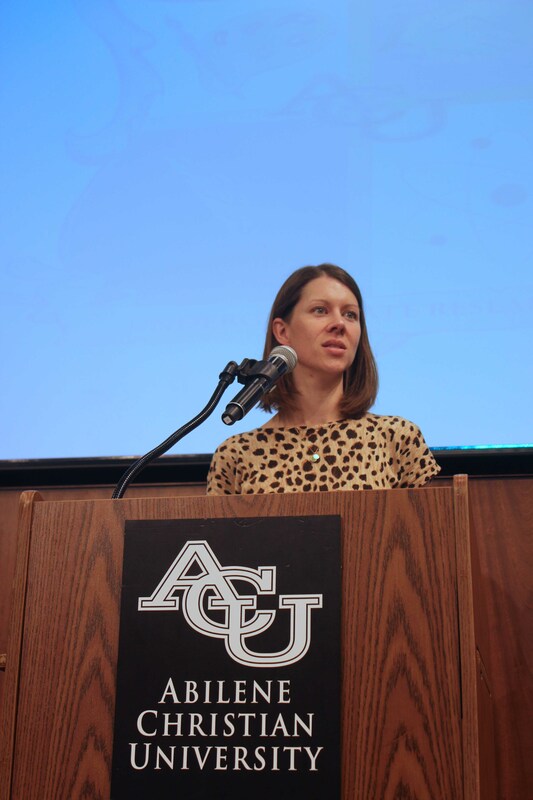 These professors are nominated and chosen by ACU students for their exemplary work as mentors to undergraduate researchers. 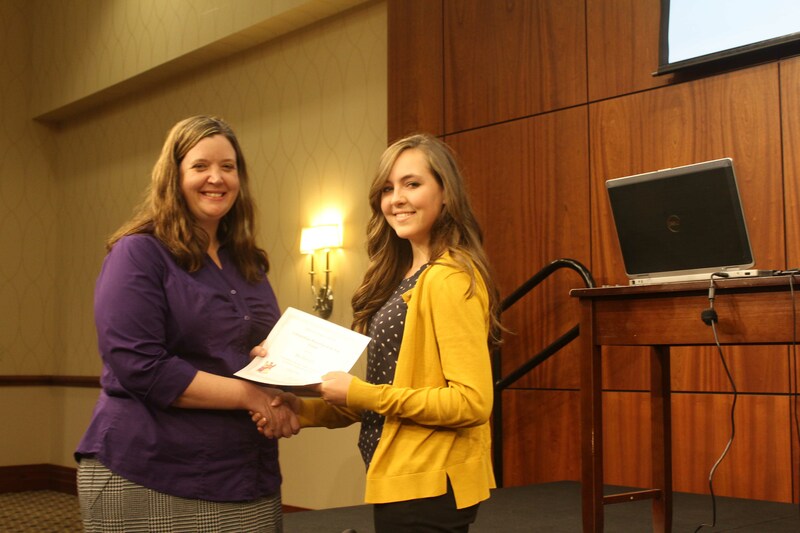 The winners are announced each year at the Undergraduate Research Festival. 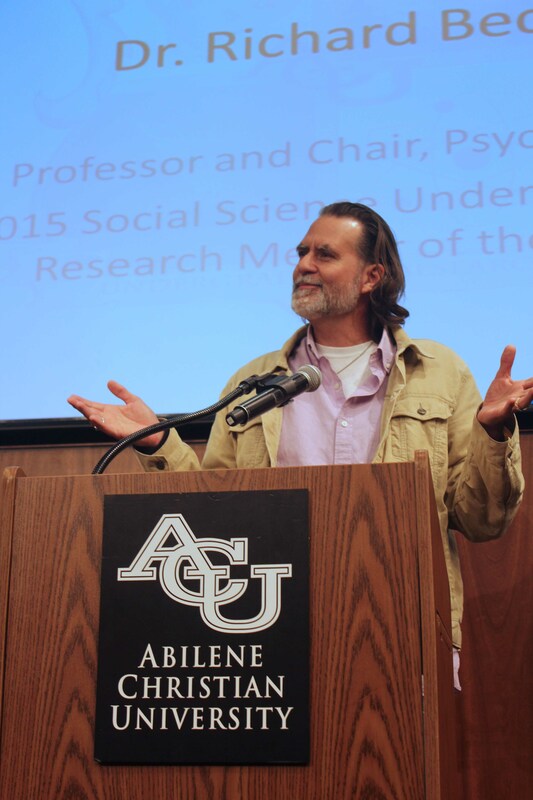 Each year, 3 professors involved in research are chosen by ACU students to receive the Mentor of the Year Award. This year the winners were Dr. Michael Daugherity, Dr. Christopher Hutson, and Dr. Anita Broxson. This mentor was nominated by his students for his enthusiasm and devotion to research and the students that he works with. His extraordinary teaching as well as his character inspires students to pursue their interests and passions. He is experienced in his field of study and relates information effectively and efficiently, helping to develop student interest in research. Dr. Daugherity has helped his students shape and form projects that have expanded their knowledge and intellect. One student said that this professor is someone that they admire and will never forget. This mentor was nominated by his students because he is an unwavering source of support and encouragement for his students’ research endeavors. His encouragement has given students the confidence to continue their projects with renewed motivation and persistence. He is excellent at communicating with his students through every stage of the research process and takes a personal interest in their work. One student said this professor has given him confidence to stay motivated throughout the research process because he has learned it can produce magnificent results. 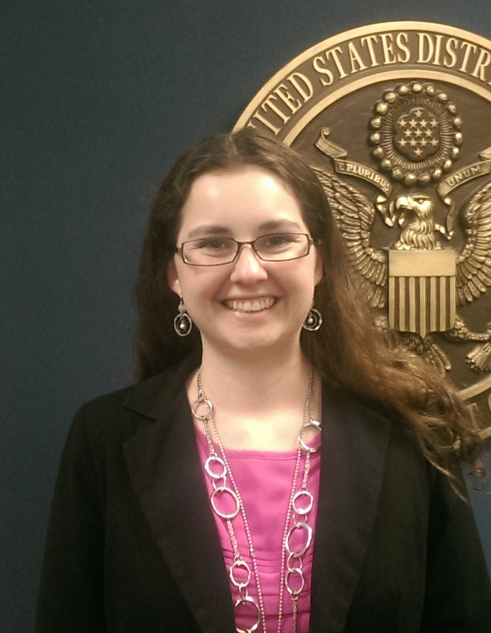 This mentor was nominated by her students for her contagious passion and enthusiasm for research. She helps her students discover their own passion for research and encourages them to think critically and view things from different perspectives. She takes a personal interest in her students and helps them discover and develop their talents with patience and understanding. She inspires a spirit of integrity in everything as she encourages her student to seek Christ in every aspect of their work. 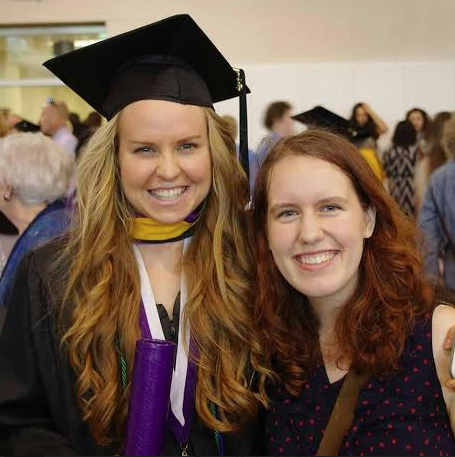 Her role as a mentor goes far beyond her research projects. She cares not only about her students’ education but their mental and spiritual well being as well. 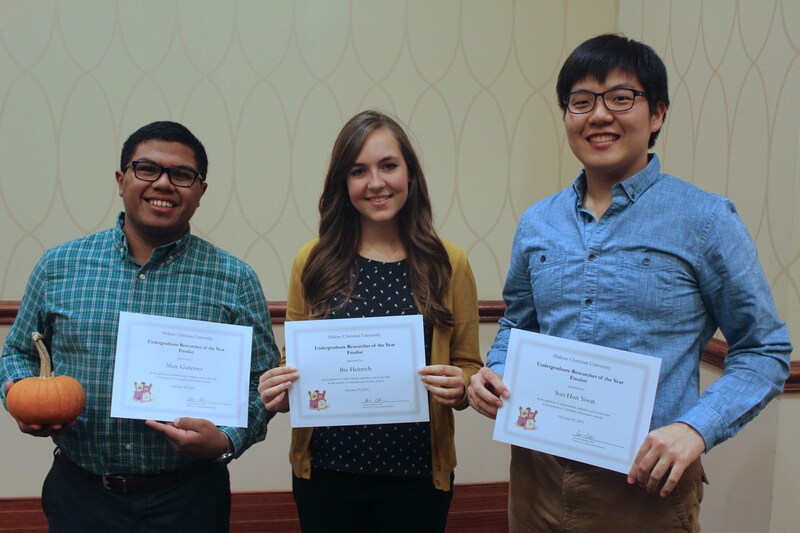 Congratulations to these professors for their exemplary role as mentors! 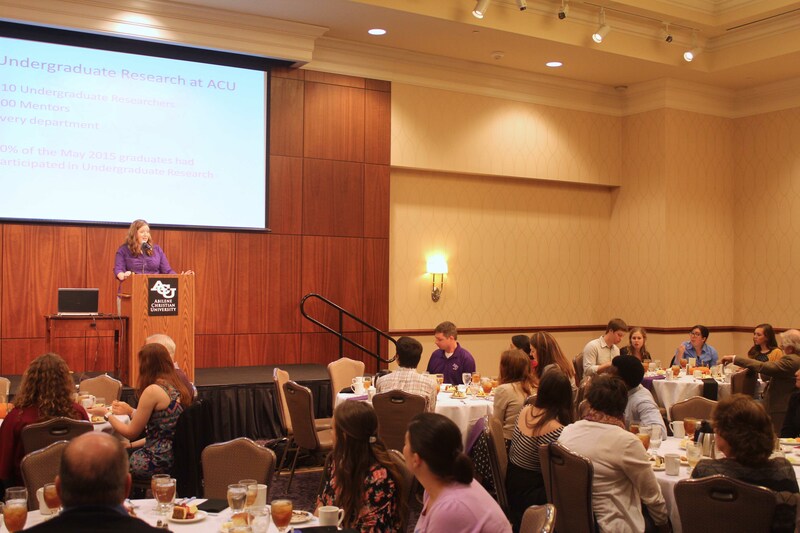 Thursday, October 30, ACU undergraduate researchers and their mentors got together to celebrate research done by ACU students in the past year. 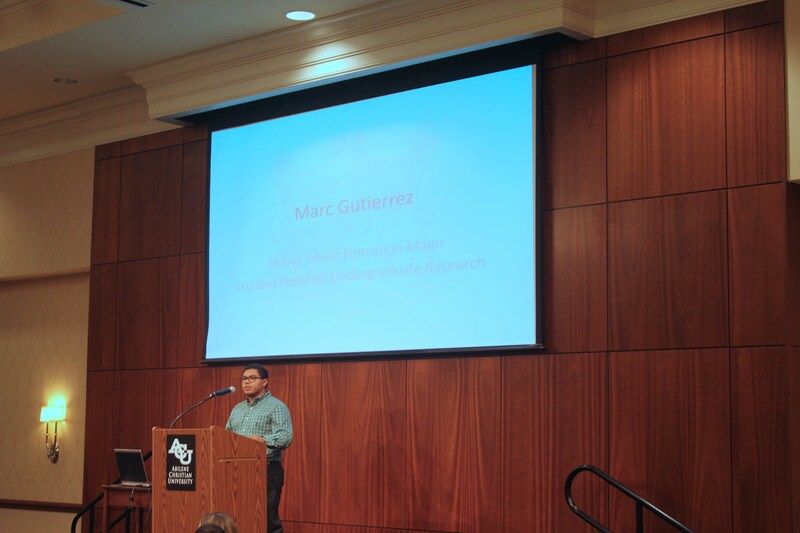 Dr. Richard Beck and student Marc Gutierrez talked about the importance they saw in undergraduate research. 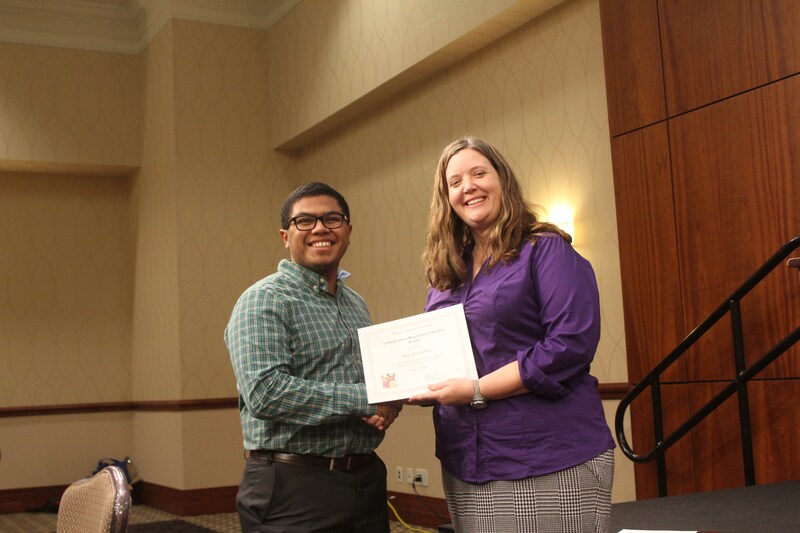 Undergraduate Researcher of the Year Finalists and Winners were announced in two categories: STEM and Arts, Humanities and Social Sciences. The finalists in STEM were Hannah Hamilton (Engineering and Physics), Kristen Clemons (Biology) and Soo Hun Yoon (Chemistry and Biochemistry). 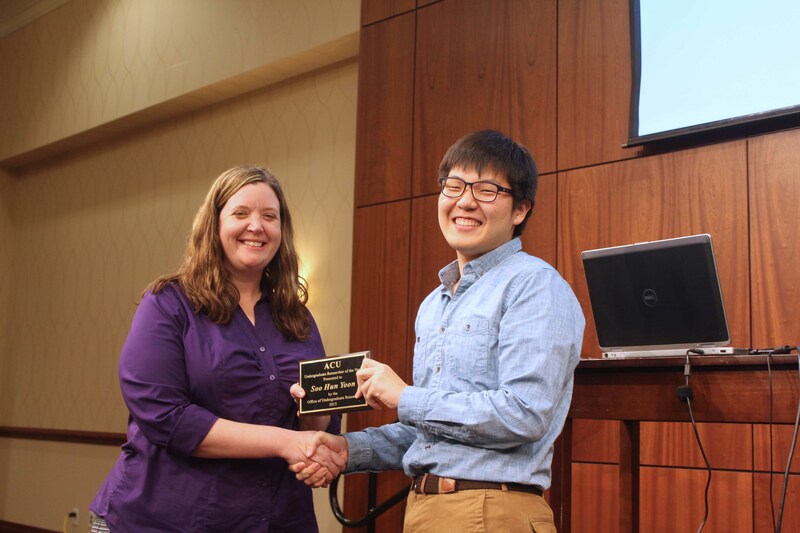 Soo Hun Yoon was named 2015 STEM Undergraduate Researcher of the Year. The finalists in Arts, Humanities and Social Sciences were Caleb Orr (Communication and Sociology and Political Science), Bre Heinrich (Social Work), and Marc Gutierrez (Music). 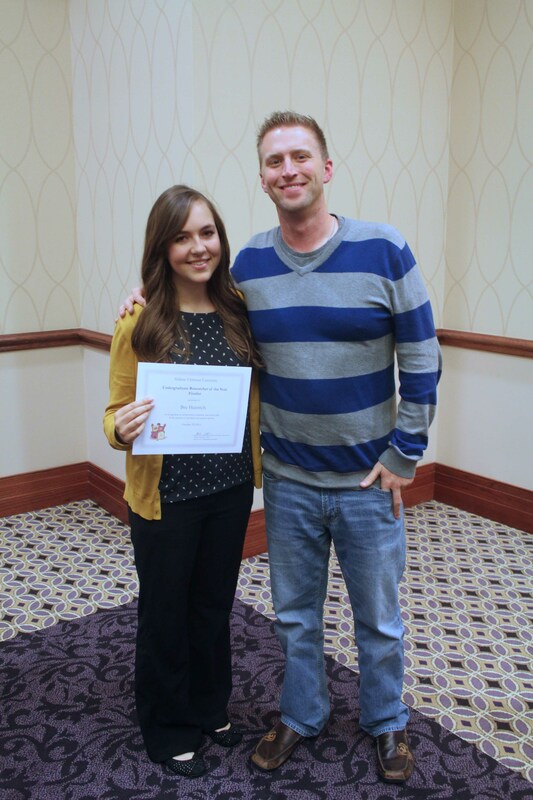 Caleb Orr was named the 2015 Arts, Humanities and Social Sciences Undergraduate Researcher of the Year. The mentors for these students in order as listed above were Dr. Rusty Towell, Dr. Jennifer Huddleston, Dr. Greg Powell, Dr. Suzie Macaluso, Dr. Stephen Baldridge and Dr. Rick Piersall. Why I’m interested in research: As a Political Science major, I enjoy studying the leaders, governments, and people of the world around me. 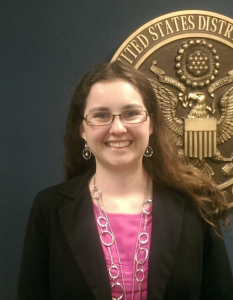 I am specifically interested in international relations and comparative politics. I love to learn about how and why countries and cultures function differently, especially as a result of past history and tradition influencing modern life. Why I’m interested in research:I do research because I enjoy learning about things in great depth–truly exploring the ins and outs of something. Research also gives me perspective on life. It allows me to accept my mistakes and failures and keep moving forward. Basically, research is 25% ideas and 75% perseverance. What I study: During my time at ACU, I have worked with Dr. Josh Brokaw studying the evolutionary and molecular biology of a plant species known as Mentzelia monoensis. Outside of ACU, I have had the privilege of studying apoptotic stress in the endoplasmic reticulum at Pepperdine University and the epigenetics of Diffuse Large B Cell Lymphoma at the Mayo Clinic.